I want to take on the following trade... its tricky, so don't do it if you don't know anything about options. GS is so freaking attractive here it hurts. It is over sold, and nicely positioned. But the financials are consolidating here, and after their move I understand why. I like GS for the long-term as well, so I want to commit to buying the stock, and selling calls around the position. 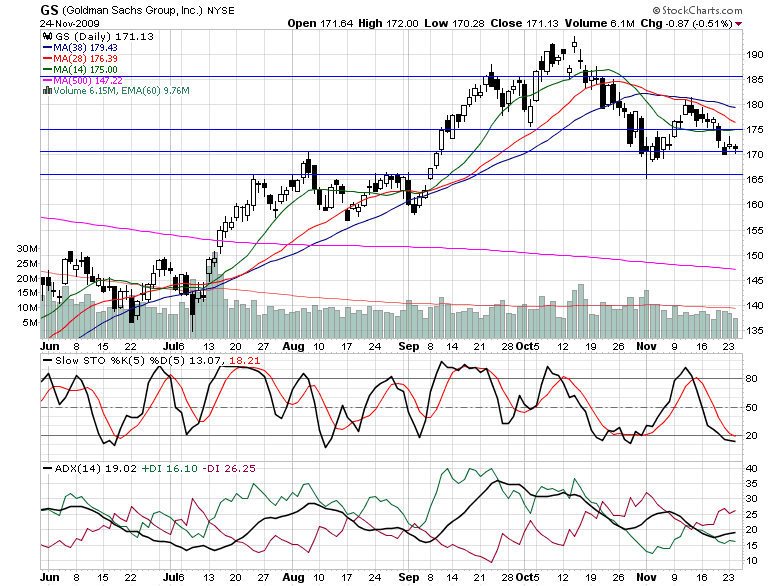 There is fairly solid support at 170, and I do not anticipate it breaking. 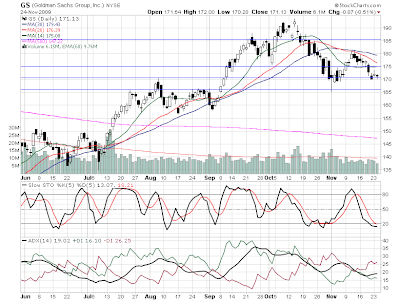 The Slow Stoch indicates it is oversold, and the DMI reveals the weakness is not that strong. Or at least not from blind selling (like PWR or CHK are experiencing). Basically the negativity is very controlled. I already own Calls betting on a push upward from here, but I want to try a new income strategy from selling calls, and hopefully benefiting from a potential dividend increase. If the markets rally by the end of the year, there is a very real possibility that GS can go to 185. So, I want to purchase 100 shares tomorrow, when it pushes to 180, sell a (one) 180 Jan 2010 Call. Then let the stock and sold call run their course. If the stock does not hold 180 by Jan 15 2010, the sold call premium is mine, and I do the same execution for the following month. If the stock goes keeps rallying to 185 past Jan 15, I will be forced to sell the 100 share at 180.